With a filmography that boasts of movies like Pramani, Madambi and The Thriller, it is difficult to approach B Unnikrishnan’s Grandmaster, with a sense of expectation, despite its impressive trailer. But then these are better times that mainstream Malayalam cinema finds itself in and so you are unexpectedly served an engaging investigation drama, without the usual humdrum and noise that comes associated with these movies. UTV’s maiden Malayalam venture is a slick non-melodramatic thriller that will gladden the hearts of Mohanlal’s genuine fans who have been cheated by his superstar persona movies in these last few years. Chandrasekhar (Mohanlal) is a washed out senior cop who after years of honorary postings in the department is made the head of Metro Crime Stopper Cell in Kochi, a cell created so that the public can alert the police if they sense the possibility of a crime happening. Once a highly regarded cop, he is now listless as he takes part in office proceedings wallowing in the separation from his wife, a criminal lawyer, Deepthi (Priyamani), supposedly due to professional rivalry and an ego clash. His only ray of hope is their daughter Dakshayini whom he meets twice in a month while the rest of the days are spent in solitude. You know he is a loner – the camera follows him as he cooks and eats alone or sits alone in the dark looking blankly at the rain. At work, when a crime is reported by an eye-witness, he’s glad to push the case to the Commissioner’s office than work on it himself and is more concerned that he is not able to find a maid to take care of his house. Eventually, he’s forced to shed his indifference and investigate a serial murder mystery that is closely linked to his life. Even then, Chandrasekhar is initially more than happy to opt out of the game and let the antagonist backtrack from the conflict but there is no alternative and he has to tackle the situation head-on. Grandmaster follows a more traditional narrative by eschewing technical gimmickry and sticking to essential police investigation. There are no hi-fi gadgets, DNA, fingerprints or any scientific jargon thrown to us and is pure old-fashioned analytical investigation at work. This suits the feel of the movie which is rolled out to the viewers in the form of an intense chess game, where the action is all in the mind, with minimal action. There is no verbal or physical bravado involved as the cops go about their job clinically. The momentum builds up slowly till the end game is reached and a final Gambit is needed to seal the match fair and square. It would be safe to assume that Unnikrishnan may have been inspired by English movies in the way Lal’s character is written and the central theme is explored but they don’t look out of place even in a more lethargic Kerala setting. Grandmaster is a quiet thriller in which the cops try to link all the threads together to unravel a bizarre murderer and it shows them on equal footing with Chandrasekhar as the team leader. It is largely a team effort and Lal’s character does not overwhelm the script with any over the top moments of brilliance. The presence of an ungainly lady Commissioner and her antics make for a few weak moments but the director does not allow their conflict to boil over and keeps the professional rivalry dignified. Several ideas are explored as part of the investigation – a killer psychopath on the prowl driven by religious ideas, a stalker of women or personal vendettas playing themselves out but none of the ideas are monopolized by an ultra-smart Chandrasekhar. Most of the action happens in the police control rooms as they try to figure out what the supposedly Alphabetic Murderer has in his mind. For a murder drama, I think that the director may have missed a trick or two in making it and edgy, dark thriller and that is what stops the movie from achieving a higher pedigree. The proceedings have a slightly laid-back feel to it, thereby reducing the overall impact of a taut script but maybe this was a deliberate attempt to go along with the mood of the characters. Since most of the story is set in urban Kerala, English language finds its way in the vocabulary being used but its frequent was irritating because it did not fit in with the overall language of the script. While Grandmaster is primarily a crime thriller, it does not distance itself from the relationship dynamics of the central characters. Chandrasekhar and his wife have a not so amicable split but there is a hint of underlying affection for each other. When Dakshayini plans to refuse the money given by her mother for her drama training, he stops her from doing so, so that her mother’s feelings are not hurt. He remains in the background trying to protect his family without informing them; when the time comes to confront Deepthi to know more about the background story of the crime, they co-operate with each other with no hint of any rancour. Deepthi takes pride in their daughter’s abilities inherited from her father and refuses Dr Jacob’s marriage proposal stating her inability to justify the marital discord. There is a palpable tension between the two men in her life but they do not allow the discomfort to mar their interactions. The father-daughter relationship is warm and brings out the only time that Chandrasekhar is in his elements as he jokes and spends time with her. Mohanlal was always expected to get the top billing for the role and he carries himself with utmost dignity, coupled with a dashing look (yes, surprisingly) in the movie. He is a thinking cop who is interested in books and chess and likes to play the waiting game patiently. You know that his physique and age does not suggest that he can bash up villains but even when he takes on a kidnapper initially, it lends itself to be believable. There is no put on accent or makeup or a deliberate policeman like gait to show earnestness; there is a natural transition to a man who demands your attention. While the role is rather restrained and not gifted with a Raghavan instinct, Unnikrishnan still drops a couple of hints of the ‘superstar’ actor when Chandrasekhar remarks that only he can do properly what he does or when he asks his daughter to ask her dramatics teacher to ask him in case of any doubts. Lot of superstar movies have very little space for the remaining actors, especially the female leads, but Priyamani, Narain and Jagathy have concrete presences in the plot. Directors of mystery movies are obsessed with the idea of spreading their net of suspicion far and wide in the plot and then suddenly pulling the rug from our feet and casting an unexpected character as the villain. When there is a deliberate attempt to plant the seed of suspicion randomly on characters, it becomes a contrived and dishonest attempt to mislead the audience and such an approach fails if the final twist is pretty incongruous, which is fortunately not the case here, even though the climax scene gets stretched a little more than needed. In Grandmaster, there is a hint of doubt that is cast on Kishore’s (Narain) girl friend Bindiya (Mithra Kurian), the psycho Victor (Babu Antony), the Police Commissioner and even the psychiatrist Dr Jacob Varghese (Anoop Menon) but the fears are not exaggerated. We know that Victor is just a ruse for a more shady character lurking in the background but it still does not make his character redundant. The logic may have been a little over the top and unexplainable on certain occasions (recollect the scene regarding the change of lyrics in Beena’s song and its linking to Alice in Wonderland) but it is mostly well grounded. However, I strongly think that directors must avoid scenes when the hero or for that matter, the villain explains the entire sequence of events in the form of soliloquy with the rest of the crew and the audience watching – these look too dramatic in any movie. In recent times, young urban film makers have been successful in creating a new cinematic grammar in Malayalam but the evidence has been fairly limited. However, the fact that second rung directors like Johnny Antony (in Masters) and Unnikrishnan are also re-modelling their style in a trickle-down effect of the changes at the top is a welcome sign. Masters showed a bit of promise but faltered big time mid-way but Grandmaster delivers more than is expected and can arguably be called among the better investigative thrillers that Malayalam has seen. The film surprises no doubt and that’s because of B.Unnkrishnan’s not so impressive track record. But this was good stuff. 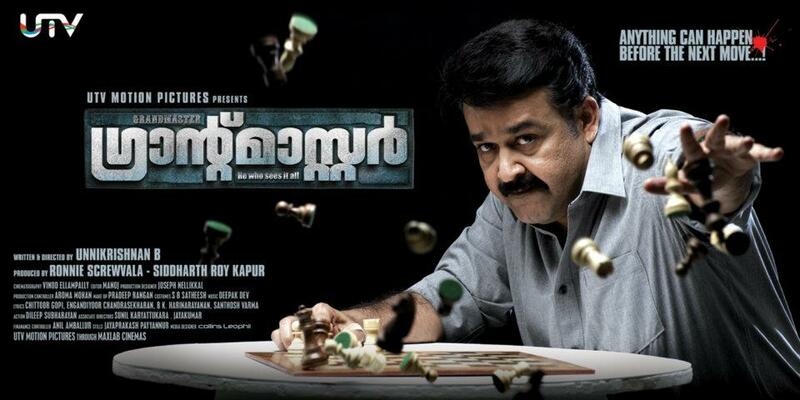 Mohanlal’s characterisation has been one of the best in recent times. And the film manages to remain engaging right till the end. This should make fans of Mohanlal happy as well. And yes a lot of the other actors also have a significant part to play in the film. It is a promising sign that even an Unnikrishnan can make intelligent cinema – the thought excites me. Of course, the low expectations made quite a difference! It begs belief why directors hesitate to give Mohanlal roles that go along with his age, when he looks absolutely untroubled in his current form. Finally caught this movie. In fact , It was a back to back session with MASTERS and GRAND MASTERS…and both did keep the game going for some time, only to falter big time as we approach the third act. The problem is despite all the tightness in the narration, the writing fails in concealing the killer deftly into the screenplay. In both instances, once the cards are played , the real culprit begin to stick out like sore thumbs and you can see it coming from a distance. And with Grandmasters, with all that religious connections added to the mix, it was clear that the writers were inspired by Da Vinci Code’s Silas character to create the necessary diversion. Though with these crime thrillers, you may find a step in the right direction, the Malayalam industry still has some catching up to do in its quest for that top notch offering! Read a few of your reviews. Really enjoyed reading them. About “Grandmaster”, I enjoyed watched. It’s inspired by a 1936 Agatha Christie novel called “The A.B.C. Murders”. Overall it was adapted well for the Malayalam audience . Thanks, Tom for dropping by…Yep, inspired by the Agatha Christie novel alright but adapted well to Kerala tastes and that too by Unnikrishnan, which was possibly the biggest surprise.. Finally watched it,was disappointed by the movie as whole,could guess who could be the killer in first 15 minutes.why the self glorification scene like lal mouthing he can only do his role.But it was only Mohanlal who made this film bearable to watch. Reproduced below is a mail sent to the author Pradeep.E by none other than B.Unnikrishnan,the director of Grandmaster !!! Pradeep, I have just read your review on GM and, I believe, this is one of the few intelligent, informed reviews of the film. Thanks. Sorry for reading it so late. I am on a long- anticipated holiday now and am catching up with all that I have missed reading. Yes, on many occasions, I have talked about my debt to Agatha Christie. Even in an interview published in The Hindu last week, I acknowledge it. In fact the first screenplay I wrote–in 1998, even before Jalamarmaram– was a kind of adaptation of Christie’s Five Little Pigs:). But the film never happened. I want to re-work that screenplay and possibly shoot it in 2014. And the only thing I disagree with you is your observation on the ” trickle down effect of the changes at the top.” Your metaphorics of a vertical hierarchy of excellence–which involves images of ‘top’ ‘ bottom’ ‘trickle down effect’ etc– is a critical fallacy, Pradeep. Frankly, I am not aware of the recent radical re-definition of cinematic grammar that you are talking about. Kindly enlighten me on this. True, there are two films which have surprised and profoundly touched me in recent times: T D Dasan and MELVILASAM. Mohan Raghavan’s sad demise is a great loss to cinema. Anyway, thanks for the review. I must confess my surprise that you came across my review in the first place. The google search engine is doing something right then:). It is a real pleasure to hear kind words by the director of a movie that one has reviewed and then dropping a mail too personally; appreciate the feedback. There were suggestions that the movie had been inspired partly by the ‘The ABC Murders’ though as the movie did suggest that it’s a slightly misleading idea which the killer would want us to believe too. Looking forward to the Agatha Christie movie script that you plan to shoot in 2014; also hoping that ‘Red Wine’ will follow the moves of Grandmaster. I haven’t seen ‘I Love Me’ but must confess, whatever I have read about it is fairly discouraging. Coming to the ‘trickle down effect’, must attribute it to my readings in economics than the vocabulary used in cinematic grammar! Looking at your directorial slate, Grandmaster definitely is vastly different and superior in terms of its content and execution and more in sync (not in terms of style but a vision) with the changes that Malayalam cinema has witnessed in the last year or two. The idea was that when the top guns start delivering, the next rung starts also starts getting its act together. As somebody who has grown up on the cinema of Padmarajan, Bharathan, Hariharan and Sibi Malayil (no longer), it seemed that there was no way that we would return to that era but the last year or so has given some hope for passionate lovers of Malayalam cinema. As you say, it must be a ‘critical fallacy’ but from the perspective of an analyst/critic, it is tempting to look at a movie not just as you see on the screen but give it an interpretation that appeals to both you and the reader. Attributing the change in the texture of your movie(s) to the changing environment seemed like a logical way to look at it. Was not too impressed with Melvilasom but TD Dasan was touching. Mohan Raghavan showed that cinema can be both simple and profound at the same time-what a pity that he’s no more. Definitely a loss for Malayalam cinema.